Let’s not talk about puffins, ponies, otters, orca or gansies for once, appealing though they may be. As I edit this piece, I’m turning a dod of glassy, green rock in my hand, a lump of oceanic mantle the size of a goose egg. Under the sea, the earth’s mantle wells up between spreading tectonic plates and reacts with seawater to metamorphose into serpentinite: not a bad symbol for the constant innovation and renewal I’ve seen even in seven years of living in Shetland. Certainly this innovation has not always without resistance, as in the case of our controversial new waterfront cinema-music venue, Mareel (reviewed here), with its two screens, café-bar, auditorium, dance studio and recording suite. At night, Mirrie Dancers, an ambitious light installation by Roxane Permar and Nayan Kulkarni, commissioned by Shetland Arts, plays over the sheeny metal cladding of the building, echoing the spectral colours of the Northern Lights. If your only knowledge of Shetland is ‘Shetland’, the BBC’s recent adaptation of Ann Cleeves’ crime novels, and you’re surprised to hear me speak about innovation and Shetland in the same sentence, you can be forgiven. The sweeping landscapes offered up as bait to the viewer failed to betray any sign of the islands’ substantial marine industries, its mixture of award-winning contemporary architecture, traditional croft-houses, ruins, ‘suburban’ developments and showy, skyline-breaking self-builds, or in fact much that showed any evidence of sophistication, materiality, conflict or complexity in island life. Overwhelmingly, the lighting of interiors was dingy. In one scene the detective Perez has need of an archivist. The Shetland Museum and Archives has attracted a string of architectural, design and tourism awards since it opened in 2007, but producers chose to shoot the scene in a claustrophobic vault (in Glasgow, I think) full of old-fashioned rolling stacks. Yes — budget, tight schedules — I hear you. But these don’t explain ‘Shetland’s’ dated wardrobes, the stilted dialogue, or the mystery — more engaging than the whodunnit’s plot — of what happened to the North Boat, in reality a boxy modern ro-ro, hefty enough to call for a fixed gangway leading from the substantial terminal. The BBC substituted a smaller boat of more traditional lines (I’m not sure if it could have accommodated a car) that disgorged its passengers onto the Victoria Dock in the heart of town. Audiences will have tuned out of ‘Shetland’ believing that its inhabitants speak a sort of generic, watered-down Glaswegian-flavoured English. Shetland Dialect is a language crammed with metaphorical idiom and onomatopoeic vocabulary, whose Nordic influences are as pronounced as its Scots. I particularly like ‘da irrups’, meaning ‘the heebie-jeebies’ and ‘spaegie’ (muscular pain caused by over-exertion). One of the huge pleasures of living here has been linguistic exploration, a constant revelation of new-to-me (sometimes very old) words. Shetland viewers forewent this pleasure, as the BBC must have deemed Dialect too great an obstacle to comprehension. But I actually think it would’ve been less offensive, and less dismaying, to have represented at least some real Shetland speech and subtitled it. So far I’ve spoken about ways in which this drama failed to represent real life in Shetland. You’re welcome to accuse me of not knowing what a fiction is; and I do recognise that it’s harder to suspend your disbelief in ‘Shetland’ if you’re lucky enough to live in Shetland. I’m foxed by how far producers have gone out of their way, though, to portray Shetland as a backward, remote, isolated place. The BBC apparently used Scandi-noir favourites such as Wallander as their model for the pilot. But the fact that UK audiences continue to enjoy (and often prefer) subtitled, Swedish Wallander to the schizophrenic adaptation with Branagh, suggests that they are, in fact, sophisticated enough to enjoy a compelling drama with greater cultural verisimilitude to present-day Shetland. This gorgeous, complex, commodity-rich place which, thanks to North Sea Oil, has been one of the richest local councils in the UK, settled for millennia by typical humans (i.e. open-minded, ignorant, compassionate, greedy, worldly, creative, perverse, generous, curious…) is surely fit material for an addictive, honest, fiction. Or perhaps the shortfall between the success of Wallander and the awkward self-consciousness of ‘Shetland’ was that its producers tried too hard (with no recourse to a Shetland advisor apparently) to shoehorn in the cultural references, with cringe-worthy results. As Detective Perez very optimistically avowed: ‘on a fine day you can see Norway’. In Wallander, in contrast, the setting of Ystad and its environs, is little more than a backdrop; the stars of the show are, well, the characters and the issues of contemporary life in Sweden. Perhaps I’m not giving ‘Shetland’ a chance, and forthcoming episodes will wade in to explore heroin abuse, rural school closures, funding cuts and a highly divisive wind-farm development of over a hundred 145m (to blade-tip) turbines recently given the green light by the Scottish Parliament. If anything risks reducing Shetland to the BBC’s inward-looking, impotent, drowsy, aphasic ‘Shetland’ it will be rural schools closures on one hand, and — I hesitate to mention it, as there’s no room here to wade into debate about it — Viking Energy’s project on the other. I do in fact know what fiction is, and something about how suspension of disbelief works (when it works). The problem here is not about fabrication, but the artistic decision to portray ‘Shetland’ as a backward place isolated from the rest of ‘civilisation’ (or the producers’ inability to see Shetland as anything else). It smacks of Edward Said’s Orientalism, which essentialised the East as a static and undeveloped Other, thereby establishing its opposite, the West, as developed, rational and superior. Practicalities of filming and casting aside, a disturbing shadow of Orientalism hangs over this dramatisation, the first instance of which is its title, ‘Shetland’. 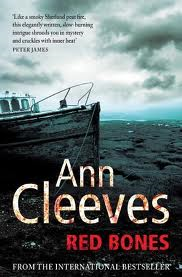 (Ann Cleeves’ novel, on which the drama was based, is called Red Bones.) Names essentialise: suggest definition. Perhaps: ‘Shetland’ — ‘a dark, remote, beautiful but boring place characterised by its denizens: a backwards, murderous people who still celebrate Viking festivals’. I can see ‘Shetland’ is not going to stem the irritating questions and statements about the place I’ve chosen to make my home. I’ve started collecting some of these, because they’re quite funny in an alarming sort of way, and amount to this wilful (and sometimes wistful) 21st Century Orientalism about island life. ‘Do you have broadband there?’ ‘Do you have roads?’ ‘But how do people make a living?’ ‘Aren’t the winters very bleak?’ ‘I suppose everyone knows everyone.’ ‘Don’t you miss trees?’ ‘Don’t you miss civilisation?’ And most offensively, I think, to both the Shetland people and myself — ‘Have you been accepted?’ By dint of the islands’ central position in the seaways of the North Atlantic, Shetland is historically far from remote, and its people accustomed to centuries of trade, friendship, cultural and genetic exchange. My overwhelming experience of Shetlanders has been of their unusually comfortable generosity, and their curiosity about the wider world, (more than usually having seen quite a lot of it for themselves). If you yearn for this undeveloped ‘Shetland’ as green as the Emerald City (set in winter, but filmed in summer, the photographer had to simulate a ‘darker’ landscape, and distract the viewer from the inconvenient background babble of breeding birds), I apologise for bursting your bubble. I first visited Shetland in 2002, very keen for it to be a blank canvas on which I could superimpose a personal mythology of the far north. I got over it. People commonly ask me if I stay here because it inspires me or if there are fewer distractions from my writing in such a ‘remote, peaceful place’. I stay because it’s proved, largely, to be a good place for me to live: to make friends, to work, to walk, to open my mind, to be creative. Of course there are reasons to contemplate leaving: there are anywhere. Perhaps there is a particular kind of mind that is attracted to islands, something that Shetland writer and editor Malachy Tallack is exploring with a new ezine. The Island Review — publishing poetry, fiction, art and non-fiction — discusses ideas of islandness, island life and island people. For me, islandness has nothing to do with simplicity. It’s a rare opportunity to experience the infinite complexity of a finite space. A useful metaphor is perhaps the intricately-involved kinetic theatre of a rockpool, or a cubic foot of highly specialised bog-life. At this time of year, the land teethes ancient dams and prehistoric walls, revealed by long shadows cast by the low light. The high Spring tides excavate middens of yoags (horse-mussels) from the shore, once used as bait by fisherman. I’m going a bit nuts, just now, as I do every year, for the smell of the changing land: stink of daffs and flowering currant. Soon, dogrose, grice-ingins (squill), banksflooer (thrift) and the honey-stink of a brain-shaped mass of moss campion, an intimate smell that you have to get on your knees to inhale. The fog rolls like carded wool down the sheer Faroese contours of the Clift Hills. Up there, the heather and moss are splattered with the silvery moult of mountain hares. Shalder (oystercatchers) are back: drilling with mud-clotted beaks in the dense mat of earth and turf. And I saw my first black lamb of the year yesterday, like a black keyhole in the grass. This is the most cursory glance over what excites me right now about the living land, which, according to Viking Energy, and despite plenty of evidence to the contrary, tourists do not come to Shetland to see. Shetland Museum and Archives The galleries integrate Shetland’s museum and archives collections for the first time to tell Shetland’s story in the most complete and accessible way. The Island Review an online magazine dedicated to great writing and visual art that comes from, is inspired by, celebrates or seeks to understand the extraordinary appeal of islands, as places and as metaphors. Launched in February 2013, the editors hope to provide an online home for islanders and island lovers everywhere. Lerwick Port Authority Ferry Terminal Lerwick Harbour, with modern, versatile facilities for a wide variety of users, is the principal commercial port for Shetland and a key component in the islands’ economy. For the past six years, Shetland’s landscape and language have persistently influenced my poetry and visual art. Since my second book Nigh-No-Place, won the T.S.Eliot Award in 2008, I’ve worked primarily as a poet, creative writing tutor, and classroom assistant, but walking, and gathering wild food and materials for my visual art-works, are as important in my creative life as my language-based practice. My third poetry collection, Byssus, is due to be published early 2014.